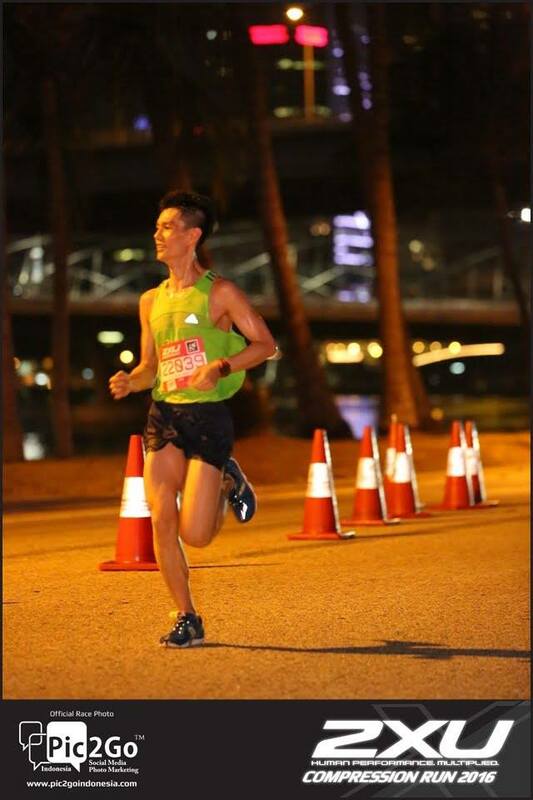 Race Review: 2XU Compression Run 2016 [HM] (by Moses) | JustRunLah! A little disclaimer: I didn’t sign up for this race and I instead, ran with a bib of the opposite gender (as with last year, how coincidental). As usual, look out for the font in italics for aspects I deem relevant in a race (feel free to suggest as well). Participants that had registered in the 2014 and 2015 edition were entitled to loyalty rates for this event, comprising of 3 categories – the HM, 10km and 5km. Race Entry Pack Collection was held on two occasions, the first on 18-20 March, 11am-7pm at Raffles City’s Atrium and the second on 1-2 April, 11am-5pm at Velocity’s Key Power International Outlet. 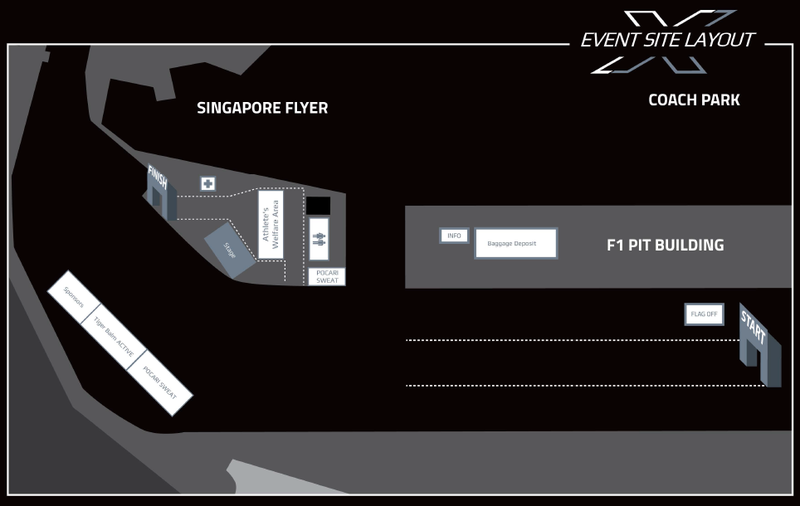 Together with some friends, I caught a cab down to the race venue (F1 pit building), arriving just around 4.20am, presumably sufficient time to deposit my baggage, use a restroom and then queue up in the start pen. However, queues for portable restrooms were unending. Unwilling to spend an unproductive time waiting for an indefinite period, I decided to venture around the nearby shopping centres to find a proper restroom (and thankfully I was successful). Baggage deposit was provided as well, taking me just beyond a minute. The Race Precinct. 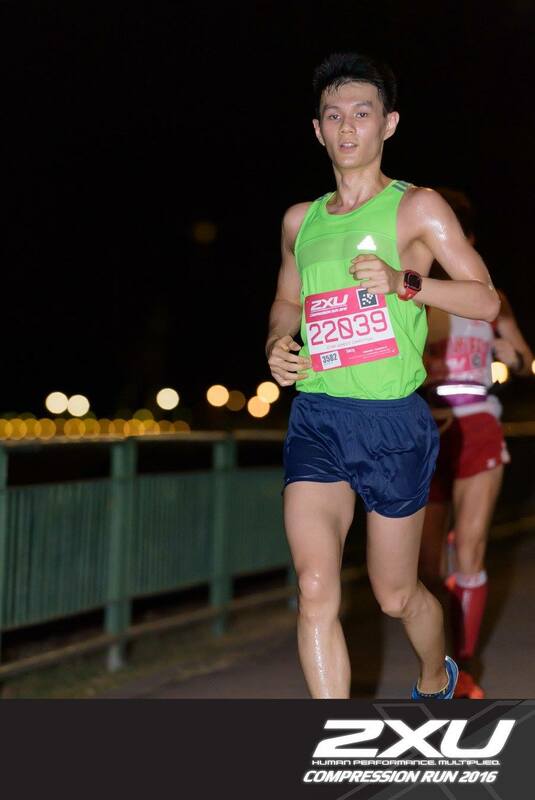 Credit to 2XU Compression Run’s Race Guide. I managed to start in the first wave, which was flagged off at 5.00am. 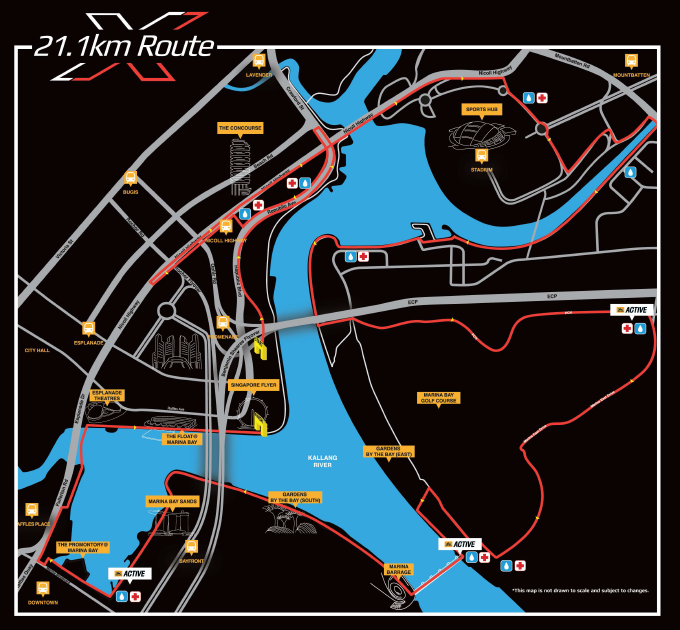 The race route would take participants along Republic Boulevard, on towards Nicoll Highway, past the Sports Hub, along Tanjong Rhu and the PCN, before progressing to Marina East Drive, past Marina Barrage, Marina Bay Sands, Esplanade, The Floating Platform and finally, back to the Singapore Flyer for the Finish. If I haven’t already lost you from this review, below’s the pictorial representation. Credit to 2XU Compression Run’s Race Guide. Along the river. Credit to Pink Apple Events. The route was largely flat, though there were some notable challenges. Firstly, there was a bottleneck (with signs reading “Narrow Path Ahead”) that runners may have experienced after the PCN. A friend relayed that a few minutes were spent trying to stroll (that was the fastest possible) past. Secondly, there was a series of steps just before the Esplanade. 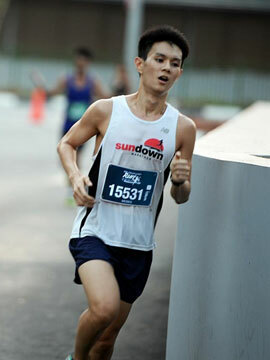 For runners who may have encountered that part of the route before the sun rose, visibility was poor. Even with adequate visibility, an obstacle this late into the race could prove to be disastrous. Though a volunteer stationed there did provide verbal warnings to participants, it would have been beneficial if other prophylactic measures were in place (makeshift ramps, warning signs, additional lighting etc). Distance markers were present at every km (if I recall accurately), though there were mild disparities (between distance markers and runners’ GPS-recorded distance) towards the last portion of the race, with the overall distance slightly short slightly shorter by 200-400m. Direction signs differentiating the routes for the different categories were present, though they were not particularly huge (I am shortsighted when running in the wee hours of the morning). Thankfully, there were volunteers stationed intermittently to direct runners accordingly. Last but not least, 8 hydration stations were located all along the course, with most stations serving both Pocari Sweat and plain water. One station towards the halfway point also did provide bananas. Just before the Finish. Credit to Pics2Go. With a little embarrassment, I collected a Finisher’s Tee and Finisher’s Medal. In addition, a bottle of Pocari Sweat and a small towel were also handed out. Post-race, runners could subsequently choose to indulge in a seemingly everlasting supply of Pocari Sweat (the kind volunteers gave me a 2L bottle! :D), a massage and get their photographs taken at a Pics2Go (the event’s official photographer) booth. Last but not least, race results were released two days after race. 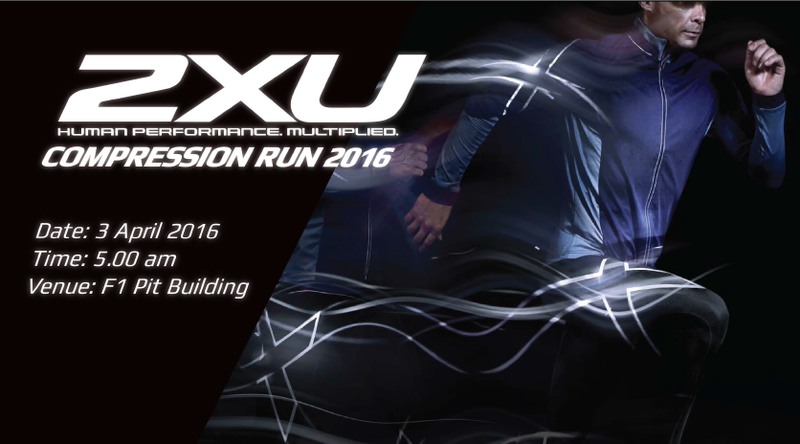 Cover photo credit: 2XU Compression Run’s Race Guide.